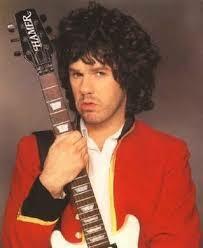 Gary Moore as a solo artist didn’t enter my radar until 1986 when I went over to England. Before that and I am ashamed of my naivety at the time, I only knew Gary as the guitarist who used to be in Thin Lizzy. Fortunately, I got a full course in the music of Gary Moore when I did get there thanks to a friend who was a big fan. As a result I got to hear lots of his albums including this one, “Victims of the Future” and I can say that my education in this subject has been top notch. Thirty years on, I have to say a special thanks to Kieran Devlin for being my teacher. 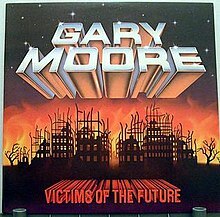 My first impressions of “Victims of the Future” as with many Gary Moore albums, now as it was then, was “He can really play a guitar.” His trademark solos permeate this album and now I am tempted to go into a rant as to how underrated he has been. That might be true in North American terms but he has always been considered one of the greats here in Britain and of course his native Ireland. Just listen to “Shapes of Things” because that is in my opinion, his best guitar work on the album. Many of the songs here are straight forward rock anthems. My personal favourite is “Teenage Idol” because that one comes out and hits me in the face the most. “Murder in the Skies” has a very cool guitar intro where he rips up the chords before the meat of the song comes pounding through. A look at history reveals that Gary wrote the song in protest of the Soviets shooting down Korean airline 007 in 1983. The same can be said for “The Devil in Her Heart” which is only on the US release. This is a good rocking song so I don’t know why it’s omitted from the UK version. “Law of the Jungle” is another exemplary rocker and the way it fades out makes it a great closer but he does go a little mellow with “Empty Rooms.” You can call it a ballad but he lays down some good guitar work on it. Not only does Gary shine on “Victims of the Future,” he enlists some great musicians. Ian Paice of Deep Purple fame plays drums on half the tracks and Bob Daisley who played with Ozzy provides the bass work on two. Noddy Holder of Slade steps in to provide backing vocals on one song. The others who support may not be as recognized but they still do a magnificent job. Therefore, the album has all one needs to be great, good vocals, a steady rhythm section and of course, Gary’s guitar solos. 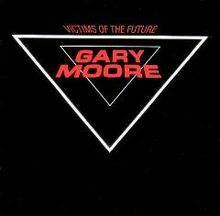 So thirty-one years on, I have to say “thank you Kieran” for introducing me to Gary Moore and playing his albums for me, “Victims of the Future” included among them. Other news: A band I have been promoting on 80smetalman, Black Emerald, has invited me to their album launch party in Reading, UK on February 10. Needless to say, I am excited and you will get a full report of the night’s festivities. This entry was posted on November 19, 2017 at 9:38 am and is filed under 1980s, Heavy Metal, Heavy Metal and the 1980s, Music, Rock, Uncategorized with tags Classic Rock, Deep Purple, Gary Moore, Guitarists, hard rock, Heavy Metal, Heavy Rock, Ireland, Ozzy Osbourne, The 1970s, The 1980s, Thin Lizzy, Victims of the Future. You can follow any responses to this entry through the RSS 2.0 feed. You can leave a response, or trackback from your own site. We Want Moore is an excellent live album …Look forward to it! That puts the pressure on, lol. It is an excellent live album, I just hope I can do it justice. The North American cover is the better one, eh? Anyhoo, I’ve been meaning to pick this one up, as I’ve seen it a few times and a friend of mine has recommended that I check out some Gary Moore stuff. Always been a bit hesitantand opting to get one of the many other LPs. Anyhoo, sounds like this is as good a place as any to start. And good stuff regarding the launch. That’s pretty awesome. There was a lot of that post holocaust type stuff everywhere back then so the North American cover is better. Definitely pick this one up though. I haven’t owned this for almost 30 years now. My mates and I used to have this on constant repeat, it’s just brilliant!